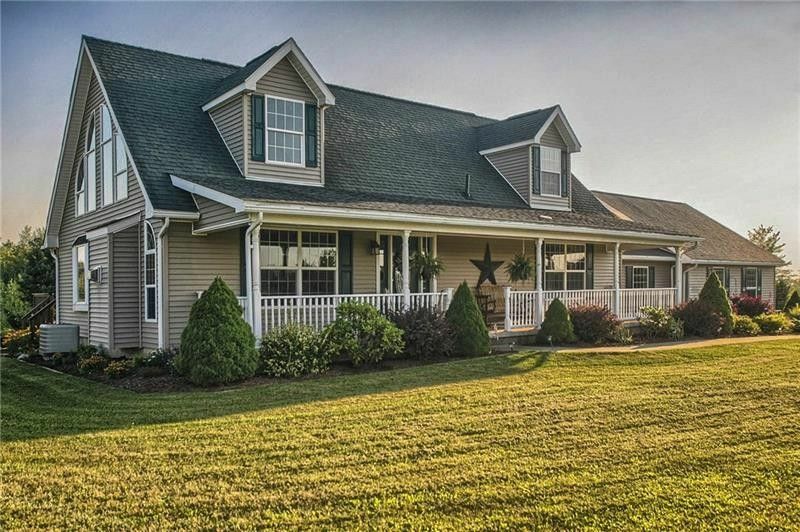 This private country escape offers a 3 Bedroom 3 Bath Cape Cod style home situated on 42.65 acres. Relax on the spacious front porch, or the rear deck! The great room offers a soaring ceiling, stone fireplace, and a wall of windows. Open floor plan with open-concept kitchen, dining area & living room together, offering the perfect space for entertaining! Master Bedroom, family room and laundry are conveniently located on the main floor! The additional den, loft and huge basement give ample room for guests, hobbies, etc. 2-car attached garage, 12x20 Amish built shed, chicken coop, and wildlife galore! Easy access to I-79 & Rt. 19. Minutes from Moraine State Park & McConnell's Mill. Approx. 45 minutes to Pittsburgh. Your Real Estate Goals Are #1 With Us!